A demonstration of the Rolling Combo. The Rolling Combo, known as the Rolling Combination (ローリングコンビネーション Rōringukonbinēshon) in Japan, is a move performed by Sonic the Hedgehog and Miles "Tails" Prower together in Sonic the Hedgehog 4: Episode II. It is a Tag Action performed on the ground where the two characters join together to perform a more powerful Spin attack. 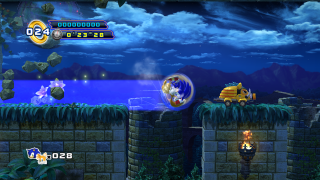 Once the player has reached a certain point in Sylvania Castle Zone Act 3, the player can press / while standing on the ground to make Sonic and Tails curl up in a yin-yang formation, then roll on ahead in a burst of speed. This is faster than a regular Spin Dash, though speed will decrease if the two bump into a wall, and the move will be stopped if they bump into a wall three times. The player can cancel the move at any time by pressing the Tag Action button again. This move is powerful enough to destroy any enemy it hits, knock down pillars and barriers, burrow through the deep snow in White Park Zone Act 1, and even take out the Snowy Badniks in one hit instead of three. It also makes the player immune to almost every environmental hazard, except for electricity and boss attacks. The Rolling Combo has seen use in multiple comic series. In the Archie comic series, Sonic and Tails have used the move both before and after the events of Worlds Collide, and in the IDW comic series, they have used the move to take out the Egg Hammers in the first issue.